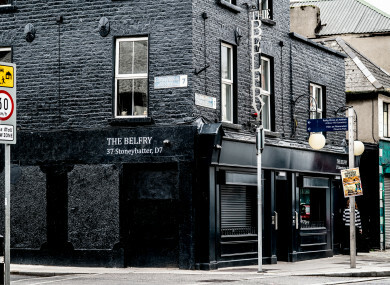 ON DECEMBER 8th 2017, The Belfry opened its doors in Stoneybatter for the first time in eight years. The pub had lain empty after changing hands during the recession. Eventually Fergus Kealy and his business partners stepped in. Kealy had moved back to Dublin from London and wanted to build a neighbourhood bar. He envisaged it as a traditional local with a modern twist. After acquiring the pub, they set about doing it up. They were eager to retain many of the pub’s original features all while putting their own stamp on it. Think upcycled furniture and prints designed by local artists. “It is quite contemporary, but we didn’t want to let go of that nice pub feeling you get when you go in somewhere,” says Kealy. While Stoneybatter may be well served when it comes to pubs, Kealy says he and his business partners identified a key constituency that wasn’t necessarily being catered for. Since opening, The Belfry has become a foodie destination of sorts, having wholeheartedly embraced the food truck trend. The pub regularly invites vendors to serve up grub in the outdoor area. Regulars include Village Pizza, Vurgerface, Feashty and The Taco Truck. “We want to give people the opportunity to do their own thing,” says Kealy. When it comes to the drinks offering, the pub is decidedly diverse with old favourites and crafty brews happily coexisting side by side. Additionally, the pub stocks nearly 40 gins and sells wine by the glass. Kealy says the pub’s first year in business was a resounding success, but a steep learning curve. So what can locals expect from year two? For one thing, Kealy says there are plans afoot to extend the beer garden ahead of the summer. The pub is also keen to continue its work within the community and intends on working with the likes of Pride and Stoneybatter Festival. Likewise, there are plans to host more exhibitions for local artists. “We just want to keep the momentum going,” he says. Email “'We just had to let it be': How The Belfry reopened a long-lost local shuttered for years”. Feedback on “'We just had to let it be': How The Belfry reopened a long-lost local shuttered for years”.